A unique project which encourages youngsters to respect and care for the environment has received £11,000 from the Glasgow Airport FlightPath Fund. The Tree Amigos project will educate 150 pupils from five primary schools in communities around the airport about a range of issues including climate change and carbon footprints. Glasgow Airport has now supported the project, which was created by Trees4Scotland, through its FlightPath Fund for three years. 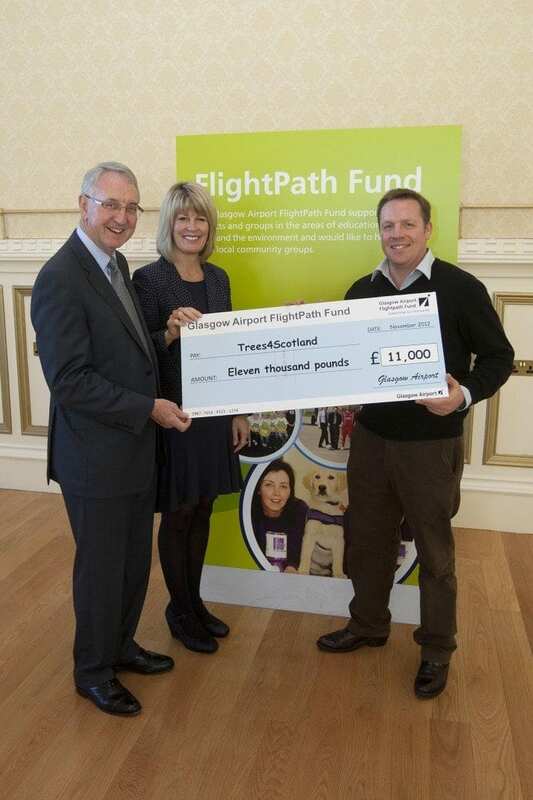 Angus Crabbie, who founded Trees4Scotland in 2008, received the cheque from Archie Hunter, chairman of the FlightPath Fund, and Amanda McMillan, managing director of Glasgow Airport, at an event in Renfrew Town Hall to celebrate the success of the Fund, which was launched in 2010. Angus will continue to work with the schools that have been involved in the project over the last 12 months, providing an opportunity to enhance the pupils’ understanding of the environment and issues like climate change. They are Killermont Primary, Bearsden, Our Holy Redeemer Primary, Clydebank, Whitecrook Primary, Clydebank, St Claire’s Primary, Drumchapel, and Rashielea Primary, Erskine. The first phase of the programme sees Angus visit each school for an introductory workshop, at which they discuss a range of issues and the importance of taking an active interest in protecting the environment. Each pupil receives an information pack and the schools work through a series of mini projects in their own time to build up the pupils’ knowledge. It culminates in a field trip to Teaghlach Wood in Perthshire, where each school plants 75 trees. Angus Crabbie said: “The support of Glasgow Airport has been invaluable in getting the Tree Amigos project off the ground. We have now had more than 1,000 children take part and it has been so successful that parts of it have been integrated into the Curriculum for Excellence.